Join the Freo fun this Monday 6 June from 10am to 4pm at the Esplanade Park and enjoy a festival of Western Australian music, food, sports, arts and culture. Here is a snapshot of the fantastic activities happening for WA Day. The Literature Centre presents fun 11am and 1pm sessions for kids at Fremantle’s Esplanade Park with WA author Raewyn Caisley and illustrator Karen Blair. Karen draws while Raewyn reveals her story ‘Hello from Nowhere’. An aboriginal artist will paint tapping sticks, which are unique Nyoongar musical instrument, and share stories of the Nyoongar language, history & culture. Presented by Fremantle’s Walyalup Aboriginal Cultural Centre. African Music Circles interactive rhythm performance and workshop that bring people together like nothing else. Combination of acrobatic dance, juggling, stilt walking, unicycling and death-defying balancing acts – all with a comedians hilarity and cabaret panache. Have fun learning about Census – Test your geography skills, take a snapshot of your family household or be your own Mayor. Learn how Census is important to you and everybody living in Australia! The Juggle Fun (Circus Skills) event stand has proven to be an event favourite for all ages. An interactive event stand where everybody can have a go. Spinning diabolos, colourful poi & ribbon twirling, ball and scarf juggling, spin stix twirling, hoola hoops, spinning plates – there is something for fun all ages to learn. Face painting, Craft and Fairytale Fun. Join the Freedom Fairies in their world of imagination and play to celebrate all things magical and WA. Fremantle Press presents: BOOKS OUT LOUD! What do ghosts, smugglers, treasure hunters, robots, a walking house and a little lost girl all have in common? To find out join local writers for storytelling and free family-friendly activities. Ten giant games providing interactive activities that the whole family can join in together. All ages can have a go and up to 40 can play at the same time. Hand painting with traditional Henna paste. Decorating the skies with various kites trains and miniature butterfly kite workshops. A founder of the Mucky Duck Bush Band, Greg is an engaging performer of Australiana and has traversed over 400,000km of Australia doing just that. Career highlights include the Children’s’ interactive show ‘Wandering In The Bush’ and his 200 songs penned and 11 original albums recorded. Renowned artist Horatio T.Birdbath has been involved in the cultural history of Fremantle for many years. His public legacy includes Horatio’s Wall (behind Gino’s), the Kings Square bollards and the mosaic planter boxes along the cappuccino strip. See displays of student writing about WA people and places. Children are given the opportunity to learn about an iconic West Australian numbat and then make their own mask to wear and take home. The PCYC Climbing Wall provides the excitement and challenge of a rock climbing experience, whilst the ‘Fun Truck’ is filled with fun recreational activities for all ages. WA Childrens Theatre will perform FLASH mob dances promoting their new show ‘The Wolf has no teeth’, the story of red riding hoods grandson and his determination to overcome anxiety. Get on down and enjoy a good ole West Australian sausage on the barbie. All fresh, local produce provided thanks to Coles, proudly supporting WA Day and your local Police and Community Youth Centre (PCYC – Fremantle branch). Join in on some WA Day fun with a skateboarding clinic at Esplanade Youth Plaza with Skateboarding WA. Registration forms available on the day or download here http://www.skateboardingwa.com.au. Under 18s require a parent/guardian signature. Duyfken is a little ship that had such a big impact on the history of Australia, being recognised as the first European ship to make contact with the shores of Australia in 1606 – some 164 years before Captain James Cooks and the British claim to Australia’s history. What! A royal walkway in Fremantle to celebrate that Queen Elizabeth II occupied the throne for 63 years? A walkway at Arthur Head that only a few years ago became the Manjarree Trail to inform people about the Aboriginal history of the area. Have people conveniently forgotten that British settlement of Western Australia did not happen at the invitation of the Wadjuk Nyoongar people but was forced upon them? Shall we ignore the atrocities at the Quod indigenous prison on Rottnest Island, the massacres and the Stolen Generations and the abuse handed out to Aboriginal children? And why would we want to celebrate a selfish monarch not willing to step down and make way for her son Charles, who is now almost getting too old to become king, because mummy does not care about his royal career. Australia is well on its way to become a republic in the foreseeable future and we don’t need a path to celebrate the archaic institution of royalty. Fremantle Society president John Dowson has called for a public meeting on February 11 about the proposed State Heritage listing for the West End Heritage Precinct. The meeting will be at Kidogot Arthouse on Bathers Beach and starts at 7 pm. Dowson writes in his email to FS members that Fremantle council chopped in half the precinct proposed by the West End Working Group, a group made up of members of the community, business and experts. Dowson wrote that the committee recommended to Council to include the whole area including Kings Square be listed, but that appears to be incorrect. The West End Working Group was given two options, surprisingly neither included Arthur Head and the state’s oldest public building the Roundhouse, and the WEWG decided to recommend to Council to adopt Option 1 with boundaries at Market Street/South Terrace and not Option 2 that went further and included Kings Square as far as Queens Street and Newman Court. 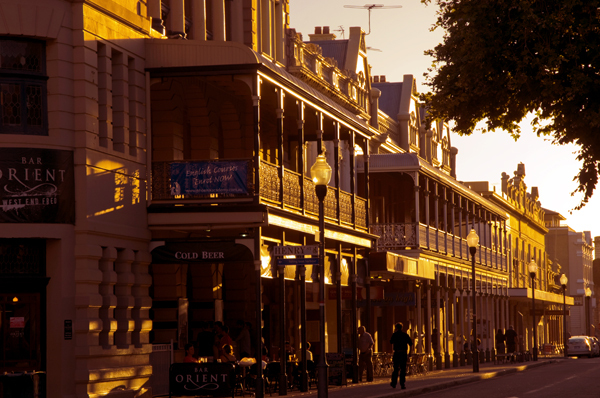 The option recommended by the WE Working Group was unanimously voted for at full Council meeting on September 25, 2013 and subsequently accepted as the area by the State Heritage Office which is now investigating to consider to ask State Government to include the Freo West End Heritage Precinct on the State Register of Heritage Places. The State Heritage Office and I have made several attempts to talk to each other but have not been successful so far, so will call them back again later today. I would specifically like to know why Arthur Head is not included in the present proposal. 15.45 pm update: I have talked to the State Heritage office and added a comment in the comment box in reply to John Dowson’s comment, so please click there. Yesterday 186 years ago on May 2, 1829 Captain Charles Fremantle announced the beginning of the Swan River Colony, which later became Western Australia. 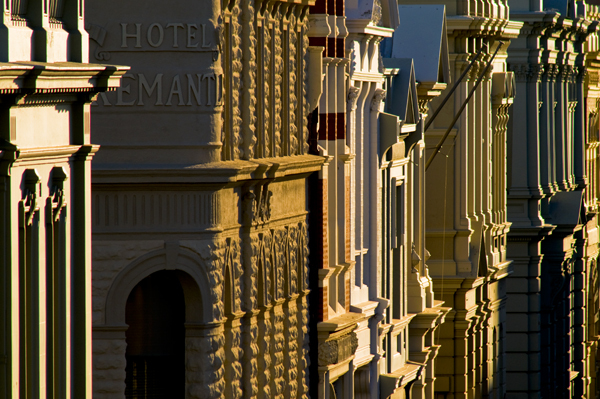 If you walk through the gorgeous heritage West End of Fremantle today just reflect for a moment on our early settlers and the hardship they endured to start this great state we live in. We often take for granted the things we should feel blessed about, so smile at everyone today in the acknowledgment that Freo is a great place to be! Now that the Fremantle Sculpture@Bathers has officially been opened I have been thinking about the historic location of the exhibition. Arthur Head is where white settlement of Western Australia all began in 1829. The Roundhouse is the oldest public building in Western Australia and the Whalers Tunnel was the first underground engineering project. At Bathers Beach the Mews family pioneered the fishing industry, the whaling station was there and so was the limestone quarry. What is now Kidogo Arthouse used to be the kerosene store and just south of there was the one-kilometre-long jetty, while near the Fishing Boat Harbour was the first ocean pool. White settlement and the Swan River Colony though was not the start of this vast land as the indigenous local Wadjuk Nyoongar people had visited Walyalup-the Fremantle area- for 50,000 years, so well before Wadjelas-white people-occupied their land and took over. I would love to see the next Sculpture@Bathers have an indigenous component and also some site-specific artworks that acknowledge the historic significance of place. Only one of the works on show refers to the whaling history of Bathers Bay. Joanna Robinson at Kidogo and Jenny Dawson at J Shed do a lot of collaborative public artwork with Nyoongar people, so maybe they can start planning some works for the next S@B. We had a bit of rain at Friday night’s opening and wild weather is forecast to hit Freo around midday, so let’s hope all the works will remain undamaged and survive the storm. The weather is going to be good on Sunday so come and visit the show and give the Go Flyboard a go! Contrary to promises from the City of Fremantle the Whalers Tunnel was again closed at 7 pm yesterday. Very disappointing!!!! The heat kept people away from Fremantle Australia Day celebrations and the numbers were well down from last year, but from 5.30 on the crowd started to turn up at Bathers Beach and the Esplanade. The Citizenship Ceremony was as always relaxed and very enjoyable. Jamie van Egmond was awarded the Fremantle Citizen of the Year and the Fremantle Foundation the Community Group of the Year. The fireworks are going off just now, so I hope everyone enjoyed them. KELP BAR OPEN AUSTRALIA DAY! The cute little KELP BAR at Kidogo Arthouse on Fremantle’s Bathers Beach will be open on Australia Day from 12 midday to 11 in the evening. The place could long have been a permanent small bar if it weren’t for Fremantle Council creating new hurdles on the way to build toilets there for years. Sit at the Indian Ocean in this lovely arty and relaxing heritage building and enjoy the fireworks and that we live in a country of freedom and beauty. Comments Off on KELP BAR OPEN AUSTRALIA DAY! 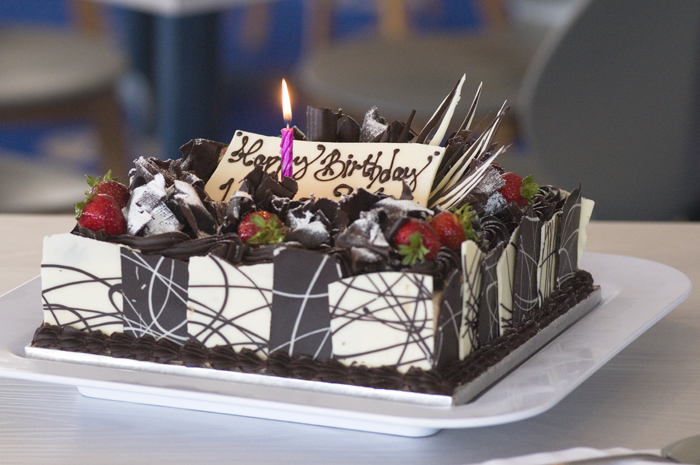 The FREMANTLE VOLUNTEER HERITAGE GUIDES celebrated the 184th birthday of the Roundhouse in style today at the Fremantle Yacht Club and of course a birthday needs to have a birthday cake. The Roundhouse officially opened on January 18,1831 and is the oldest public building in Western Australia and a purpose-built jail. Comments Off on HAPPY 184TH ROUNDHOUSE!